We spend the majority of our time preparing for a trade show and by the time the event arrives, the focus turns to selling. However, what effort is spent after the event to make the most of the investment spent on participating in the trade show? If you have ever worked a trade show you know the definition of sheer exhaustion. You and your team are on your feet from dawn to dusk, shaking hands, collecting business cards, demonstrating your products and hopefully writing orders. But once the event is over, what follow up actions do you take to make the most of those that visited your trade show displays but perhaps didn’t make an immediate purchase? The best use of a follow-up campaign is to qualify leads by offering a range of options for further engagement. Any response (e.g. a white paper download, a demo request) can help uncover hot leads that might otherwise be missed, or at the very least can help sales prioritize which leads merit being called first. Don’t let your trade show investment miss the mark by dropping the ball on follow up – consider these Qs for your business. QUALIFY – When you are still in person with a prospect, gather enough information about them, their company and their needs so that you understand what products or services they are most interested in. This will help in the development of your future communications. Rather than adopting the shotgun approach of follow-up where you just send them a little bit of everything and hope something hits the target; by qualifying at the show, you will be able to communicate a more targeted follow-up message. QUICK – Strike while the fire is hot. Before the trade show attendees have a chance to get caught up in their business at hand, make sure they have a follow up message from you and your team. One of the best ways to do that is through the use of a great application designed to help in the process. Consider the iPad trade show app to help capture information at the time of your conversation and then customize your sales materials to meet their specific needs. QUALITY – Using the information you gathered during the qualifying process, make sure the information you send offers a quality message; a message customized to their needs. Rather than creating a single generic follow-up message, take the time to actually customize the communication to ensure the prospect knows you remember them and your conversation. Consider adding a few personal comments about the day, their business or your conversation which will help your message stand out from the hundreds of other emails they receive each day. You might also consider going “old school” and sending a follow up package through the mail. Once you have worked through your list make sure that you continue the opportunity to connect by adding their email to your e-newsletter list. Remember – prospects need to see your name at least once a month to keep you top of mind for when they need your products or services. If you are interested in learning more about trade show management, we are here to help. 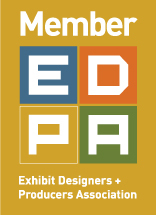 Give us a call or visit our website: E&E Exhibit Solutions. Our non-trade show, large format digital graphics website, E&E Graphic Innovations has changed. Take a moment to visit and bookmark for future non-trade show large format printing needs. We are mobile friendly – so feel free to use your smart phone. Check out our new portfolio!